(MP062). Rowland Langmaid (1897-1956). Etching, proof copy, signed but not dated..
Print size: 12.5 x 7ins (32 x 18cms) approx. 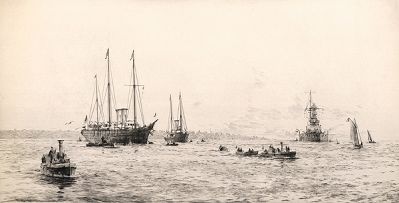 V&A was a regular visitor at Cowes Week where she is depicted here in Langmaid's etching, together with the Guardship ( a battleship of the Queen Elizabeth Class) and Trinity House Vessel PATRICIA. The Yacht's distinctive profile with those three impossibly tall masts from which floated huge Court Flags graced the many Fleet Reviews and other nautical pageants held during the period, and those who served in her invariably cherished their time on board. She never recommissioned after the Second World War and was broken up in the Gareloch, Scotland in 1954 once BRITANNIA was safely commissioned. Etching size: 12.5 x 7 ins (32 x 18cms). Mounted : 18 x 13 ins (46 x 34cms) approx.